The first Orange County Happsters Squad has officially launched with Jenna Stahnke as its fearless leader! I’m a pretty simple and laid back person so the 3 things that make me the happiest are my fiancé, the beach, and puppies! We don’t have a dog yet but if there’s one in sight, I will be petting it! I just finished reading “You are a Badass” by Jen Sincero (I highly recommend that one) and I’m now reading “Resilient” by Rick Hanson. I love reading books that lift me up and pattern interrupt the everyday stuff going on! Also, Jordan Younger’s, aka The Balanced Blonde on Instagram, “Soul on Fire” podcast is AMAZING. She’s constantly trying new wellness tips + tricks, sharing other’s experiences, and is pro at keeping it real. My dream job is something I’m already doing actually! I’ve always wanted my own time + freedom to be on my terms and be able to explore whatever passions I want; so right after college I jumped into the freelance marketing world and have been loving it! I currently work remote for an amazing startup in San Francisco. We are building a tool that integrates into Instagram and helps influencers build their business. It’s been such a creative passion of mine to work in the Instagram space and help others as well. This type of work allows me to travel with my fiancé, who is an entrepreneur, speaker, and author. We are always on-the-go and I love it! I’m really big into fitness and nutrition so I think eventually I will move more into that space. It would be amazing to become a health coach one day and help others! I’m a really diverse Netflix watcher! I’m either binging on mystery / murder shows or Say Yes to the Dress. I’m a sucker for really bad tv too lol. 5. What are your favorite things to do in Orange County? Since moving to OC about a year ago, I’ve been obsessed with trying out all the new fitness and wellness places! That is such a popping trend right now and I’m loving it. From finding new juice places and cryotherapy spots to sweating at a new studio, there is endless spots for me to try! I secretly do calligraphy for fun / sometimes for business. I taught myself a few years ago and find it so fascinating. I created an Etsy shop just for fun and have even sold a few pieces on there! I plan to do all my wedding with DIY calligraphy pieces that I create. I love this quote because it embodies everything that is important. The only way to impact more people and give back is by becoming more, becoming the best version of ourselves. I just moved into a new home with my fiancé and it is my favorite place to relax and find peace. We call it our sanctuary! We have held many family gatherings, game nights, and out-of-towners. It truly holds so many memories and I’m excited to make more in it with the OC Happsters Squad! 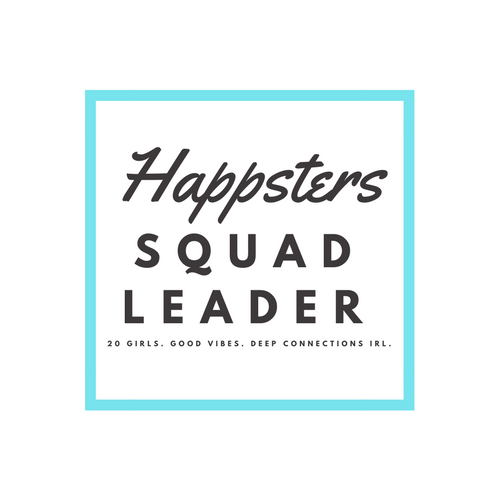 Interested in joining a Happsters Squad near you? Click here.